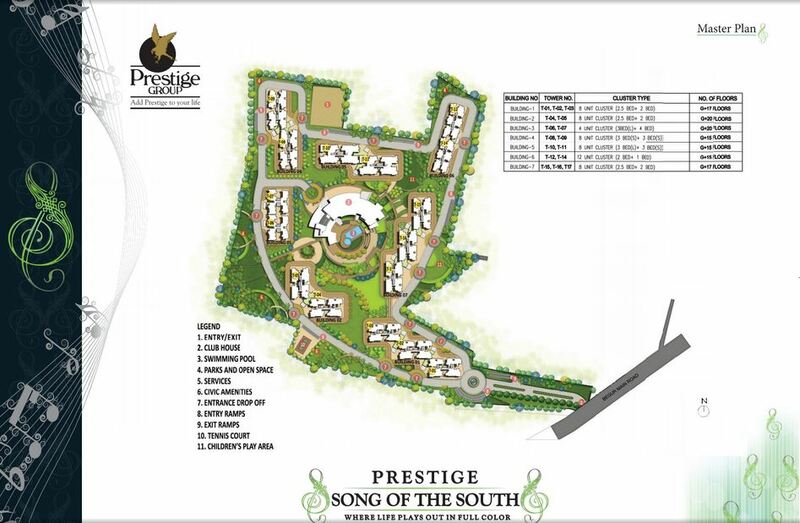 Prestige Song Of The South, as the name indicates this Residential project is perfect collaboration between Nature’s elegance coupled with Intelligence of Mankind blended in perfect ratio resulting in such unique colony. This Pre launch project by Prestige Group is coming up in Begur, Off Bannerghatta Road in South Bangalore. This residential development is spread across 33 acres of land area. Project consists of 1,1+study, 2, 2 +study, 3 , 3+Servant and 4 BHK apartments and starting budget is Rs. 31.98 Lakhs (Basic Price). 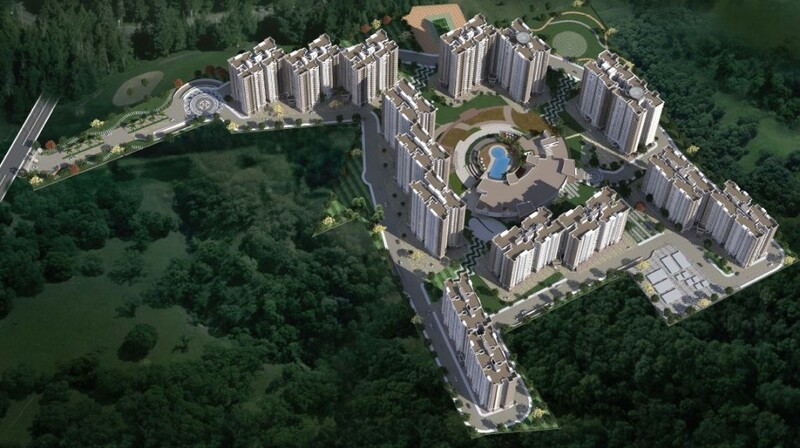 There are 16 Towers incorporating 2234 units of various types within 7 Blocks in Prestige Song of the South. Entrance to the project is from Begur Main Road. Check out Master Plan – Prestige Song Of the South. Total project consists of 256 units of 1 BHK , 724 Units of 2 BHK, 580 Units of 2.5 BHK, 380 units of 3 BHK , 208 Units of 3 BHK + Servant and 80 Units of 4 BHK. Tower 5, 6, 7, 8 9 will face Hulimavi lake. Tower 10 and 11 will give visual treat of the city so it is called city view. 2 and 2.5 BHK apartments. Each tower has G + 17 Floors. Block 2 has 2 towers ( T- 04, T- 05 ). 2 and 2.5 BHK apartment. Each tower has G + 20 Floors. Block 3 has 2 towers ( T- 06, T- 07 ). 3 BHK Large size and 4 BHK apartments. Each tower has G + 20 Floors. Block 4 has 2 towers ( T- 08, T- 09 ). 3 BHK Small Size Apartments. Each tower has G + 15 Floors. Block 5 has 2 towers ( T- 10, T- 11 ). 3 BHK Small and Large Size Apartments. Each tower has G + 15 Floors. Block 6 has 2 towers ( T- 12, T- 14 ). 1 and 2 BHK apartments. Each tower has G + 15 Floors. Prestige Song of the South was officially pre launched on 31 – July – 2015. Project will be developed in two phases. Completion / Possession will be in mid of 2019. Project has got 75 % Open Space. It is approved by BDA and BBMP. 60,000 sft Circular Club house with Olympic size swimming pool. 200 meters from Begur Main Road. It is next to Hulimavu Lake. Each apartment comes with utility in Kitchen. Retail shop in club house. Begur road..is approved for 80 ft road by government. Construction will start shortly. Connectivity is good . Bommanahalli, Electronic City, Banerghatta Road, NICE Road and Kanakapura Road all are with 3 KMS distance. International Schools – Ryan , BGS, Vibgyor, Candor. Premium B School IIM Bangalore is on Bannerghatta Road. Fortis and Apollo hospital are near by. Consists of 1, 1.5, 2, 2.5, 3, and 4 Apartments. Spanned over an area of 33 acres. Prestige Notting Hill is 3.5 Kilometers. Bore well and Cauvery Water. Adequate network available of transport for all major locations. Placed in Heart of IT sector of the city. Prestige Song of The South is placed in a perfect spot which is at the center of three major location Electronic city, Begur and Bannerghatta road . This Projects is located right next to Hulimavu Lake. Two road link running in parallel, Bannerghatta road and Hosur Highway ,within the a few km reach (5km approx ) on both side. Adequate local transport and wide space ring road and highways which would connect the rest part of the Bangalore with in short span would be the added advantage for this project. Proposed Namma Metro station Hulimavu Line 4 phase 2 is expected to be completed by end of December 2019. 1 , 2 , 2.5 and 3 BHK Small will have 1 balcony in living room. 3 BHK large and 4 BHK will have 2 balcony. One in master Bed room and 1 in living room. 4 BHK will have bath rooms for servant separately. Delay Compensation will be bank interest after grace period. Transfer Fees (Rs/sft) (Sale Before Registration) is Rs. 100. Lock-in Period – 3 Installments. Well suited for MNC and IT Employees who are employed in and the surrounding location of the area. Investing in this would be a surely fetch you a benefit of good returns since it is product of one of the renowned identity of this Field. Prestige Construction, an ISO 9001:2000 Certified company is the only Property Developer in Bangalore who have been awarded by FIABCI for its eminent facilities both in their Units and through their software. Recently we are also awarded with the “Crisis DA1 Developer Rating” which marks based on the quality of the project and the ability to handover the units to its customer well within its announced Possession agreed before. Project is located in one of briskly growing part of Bangalore which has been substituted as an Investor HUB. Prestige group has always concentrated not only the quality but also on the economy of the major group of the community to which this project is been well suited. Prestige Song of the South Promoted by HomeAdda Bangalore	Disclaimer: Any content mentioned in this website is for information purpose only and Prices are subject to change without notice. This website is just for the purpose of information only and not to be considered as an official website.